I love the first dress and outfit #2 as well. Actually I like all of these including the fail. That shade of pink is brilliant on you. I am not seeing big and tired at all. ETA that top is from Kohls?! I was sure it was super expensive from the look of it. Thank you Shevia! I just added Finds. The two dresses are off eBay so I don't know how to Find them. Guess I should try the Custom Finds feature? Mmmm I don't think your fails are that bad. 1 2 3 6 8 are all great outfits, I especially love 3 but I have serious sugar eye for black and white looks. I love it. I think the shirt in 6 is wonderful too. 7 - is my least favourite. It looks a little preppy for your normal style and while I agree the colours are great I am not in love with the pieces on you. I struggle big time with shorts - and to me these are not short enough. However I get that sometimes you don't want to be too short, and longer is hotter. 9, is the top just too big, or would it be better with slim bottoms. I don't mind the look but would prefer a different tee and possibly a belt? I would not describe it as a fail, more just a casual comfortable look. Honestly some of your fails are like my successes! I was just thinking the other day that you hadn't posted much lately,mand I like to see your casual looks I like the stripe tee look the best. Not fond of the boyfriend jeans look for you. However, as Shevia said, I'm not seeing big and tired. I am so happy to see you again! I actually really like 7 for a casual summer outfit and that color is wonderful on you. Would love a straight on shot of the Vince dress. That last top would be fine with a jacket or cardi - I have lots of tops I don't wear alone. But maybe that isn't practical for your weather. So nice to see you post, Denise, and wow, your fails are like most people's wins! I like all of these. Admittedly I am biased, since 7 is sort of how I look (if I'm lucky) on my work from home summer days. How lucky about that Vince dress -- good thing it packs well. And the top from Kohls looks like an amazing find. My favorites are 2 and 6. I dont think 7 is problematic. It lacks the drama of some of your outfits but looks fine. And 9 might just be an issue of volume/proportion like Kiwigal said. Love your style :) my favorites 1 to 5 & 8. Kiwigal -- Good observation, #7 is a bit preppy. I think it's the shorts. I don't know how to make them more me. They are officially going in the holding zone. Alaskagirl -- Straight shot of dress attached. I think this is a design that Vince has repeated. This is the seller I got the dress from and some other ones they have for sale right now. They buy returns and overstocks from Macy's and Bloomingdale's, as well as some other sources but I stalk this seller for their Bloomie's merchandise. Suz -- I've seen your Summer work from home outfits and somehow you manage to elevate those outfits. Probably you buy better shorts to begin with LOL. It's hard to be stylish in hot weather isn't it. Cocolion, you are so fab. I love your style and how it seems to fit your life in such a lovely way. Love 2, 5 and 6. You look perfect for summer! I sure hope that by "got rid of" that top in #7 you meant "stuck it somewhere easy to retrieve" -- but then you know I love you in those light + warm bright shades! Given your comments about feeling wider and blah in some of these, Q: are you maybe moving toward more sleek and fitted looks? I have several billowy unstructured blouses and can feel the same if the sleeves hit various points. I like them best *under* cardigans or jackets but whatcha gonna do in the heat. I'm ok with waist surrendering, but prefer it with sleeveless or sleeker, longer sleeves. Just a thought. Dee -- I think you're right, I need a different top to go with those crops. They are not very flattering but they are so comfortable. They offer coverage but coolness even on the hottest day. I will try wearing them with a more fitted top before I completely give up on them. Irina -- Thank you for saying you like #8. I'm attached to my sort of ugly Mom jeans but know they are just barely JFE. Krishnidoux -- you words are so kind. I hope you are doing well and maybe we will get to see you soon? Maneera -- Thank you! 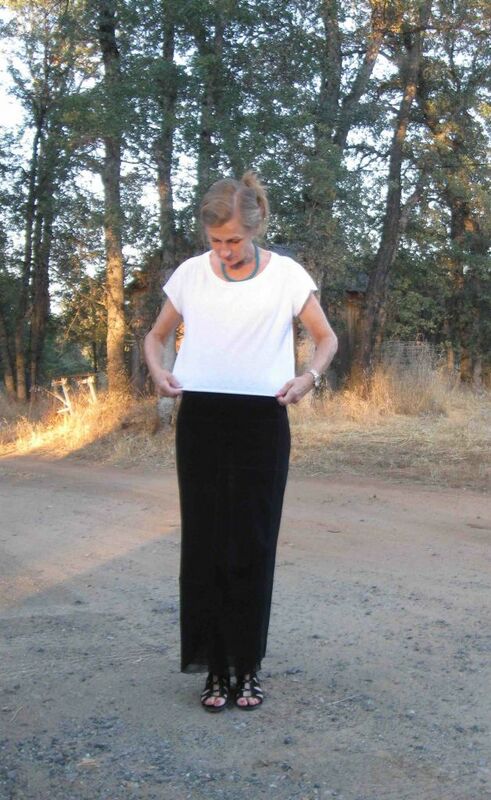 You must "get" how wearing loose clothes bottom and top works in hot weather. Vix -- No the top hasn't made to donation yet! Thank you for weighing in on the color as I have so much respect for your design and color knowledge. I haven't made a conscious effort to wear more streamlined or fitted clothing. I think I would feel better about committing to fitted fits if I were a bit more toned or lost a few more pounds. I like all of these outfits! You dress up and down with equal amounts of chic. As I read your post, I was thinking you have really high standards, because I'd be happy with the white shorts and coral tee outfit. With the last one, I'd add a belt, but I don't see it as unflattering. I'd put it in the JFE camp, not a traditionally flattering look. That said, if an outfit makes me feel like I look "big and tired," it's not going to get repeated! I really like the black and white outfit, and it makes me smile to see Marc Jacobs and Land's End in the same outfit. Love your outfit with the plaid Kohl's top, too. I so love your style and here you do it again. I love all of them and for being right for each event. I like all of them except for 9, which isn't too bad and can perhaps be rigged as per suggestions above. And I can't really tell you are wearing mom jeans if you don't tuck them in! 1 and 2 are very stylish! Personally, I would be happy with all of these looks! Wow! Totally fab! I see how there are subtle differences but they are very slight. Maybe I'm not enough of a critic, or one year on the forum has not yet honed my eye enough to be picky enough? Very fun to see you post again, Denise. I'm glad YLF featured in your down time which is at a severe shortage for you at the moment. The party outfit is gorgeously killer - I LOVE you in ankle strap sandals. They were made for you. (I'm chuckling at you forgetting your skirt- good thing you had a brilliant back up plan). You are gorgeous in shades of coral. Agreed. The cap sleeve tee is a little conservative for your style. The checked shirt outfit is killer too. I actually like them all Denise. I swear you'd look good in a bin bag! Perhaps the capped sleeves aren't for you but I still think for hot weather wear it looks pretty darn good. I also don't see big and tired in #9 either. Love you in coral! I really love #3 - dots and stripes - what's not to love? I looked at the pictures before reading and immediately had to see where the plaid shirt was from. I really love it! I can't believe you forgot your skirt and thank goodness you threw the dress in! You look great though! The black and white outfit is near and dear to my B&W loving heart. I'm always inspired by your outfits. Baby shower dress is good. That Kohl's shirt is amazing. I concur #7 isn't you. Paige crop jeans seem just like basic boyfriends, not really special or interesting. I like the mom jeans a lot. Oh, no. 3 makes me so happy!! :) And I love you in coral! A CocoLion outfit post is always such a treat! And when are you coming back to So Cal? I'd love to put you up in my new guest room! How did I miss this? I'm late! But wow wow wow I love #3, so perfect and fun! And sorry, but I love #7 too. I don't see any fails at all! Of them all, I'm the least fond of #9, but I don't see fail. Love seeing your sophisticated take on casual So-Cal looks! I love the modern looks in #1 and #2 particularly, but I'm also very fond of the black an white outfit. Now, it's true that I have a sugar eye for high contrast, but the bold-Parisian look is fun and great for a trip to SF. This seems more like your take on classic, as opposed to #7, which is crisp and flattering, but more conservative. What about a slight taper on the white shorts? Just at the bottom? You might also try a bolder, edgier belt and shoes. Shopping at Kohls (which I do constantly) has gotten harder -- I don't think their buyers are doing them any favors these days, so I'm glad to see your finding some treasures! Oh my. Please dress me from your holding zone. I like all of these.